Jennifer is originally from the Midwest and relocated to New Mexico in her teens. With a MS in environmental science and policy she spent over 15 years working exclusively in avian ecology. 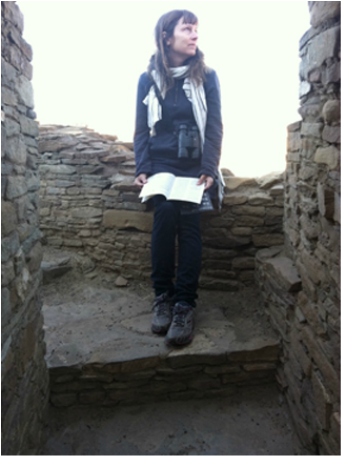 She has conducted fieldwork in Panama, Australia, and areas all over the US. Jennifer is a specialist in bioacoustic analysis, photo and film analysis, avian trapping and tracking techniques, and has worked in assessment phases of off shore wind areas as well as pre-assessment of the NRDA process during the gulf oil spill. In addition to her work with Mesa Prieta she also runs her own small textile business as Tiny Odd Bird. Jennifer lives in Dixon with her husband Brian and their dogs Loki and Left-Eye. In January, 2017, Jennifer was promoted to the full time position of MPPP Project Administrator and in April, 2018, she was promoted to Project Director. She brings wonderful talents to the Project!